Newmont Mining Corp. (NEM) has informed the market on Monday that the Subika underground project in Ghana has reached the production of salable gold. The high-grade mineral deposit, where Newmont Mining will produce the metal at one of the lowest costs of the company, is located near the Ahafo mine. The project has been delivered on time with the company's plan and represents the third profitable expansion achieved by Newmont Mining in 2018 after the completion of the Twin Creeks Underground and Northwest Exodus expansion projects in Nevada. For the development of the Subika underground project, the large U.S.gold producer has made investments of about $186 million staying at budget. Shareholders of Newmont Mining Corp. will for sure positively welcome this important step forward in Ghana because the asset will give a significant contribution to the overall line of operations of the company in terms of increased production, a more contained cost per ounce of produced metal and a higher gold margin. Subika Underground will start contributing in early 2019 with an annual production of gold that will average 150,000 to 200,000 ounces over the first five years of operations or approximately 3.4-3.6% of total attributable gold production of Newmont Mining Corp. The underground mine is supposed to produce gold for at least 10 years. In fact, the existence of specific characteristics of mineralization at the contiguous orebodies and the availability of platform and advanced mining technologies consent to be optimistic about an extension of operations well beyond 2028. Investors can profit from this catalyst by acquiring shares of Newmont Mining Corp. on the New York Stock Exchange. The share price at close Monday was $32.47, reflecting a 13% downside from the previous 52 weeks. The share price is below the 200-, 100-day simple moving average lines but above the 50-SMA lines. The share price at close Monday is not one of the cheapest, since it is nearly 12% above the 52-week low of $29.06. However, it is still underneath the mid-point of $35.60 of the 52-week range, whose high is $42.04. 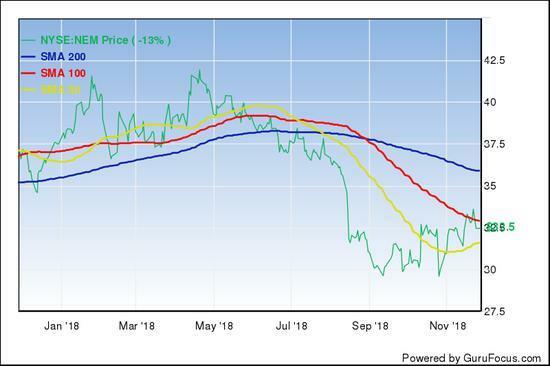 Further, a price-book ratio of 1.63 versus an industry median of 1.74 and an EV-Ebitda ratio of 9.02 compared to an industry median of 9.3 adds to the opinion of those analysts for an affordable investment, meaning they are suggesting increasing Newmont Mining. These analysts are not a few because as of November there are 11 analysts out of 18 who suggest buying shares of the US miners with two of them set for a strong buy. While seven analysts are for a holding approach. There is another important metric that gold mine investors usually take into consideration when they judge whether a mineral project is financially robust or not. This is the internal rate of return (IRR) that in the case of the Subika underground project will stand at around 20%. An IRR of 20% is not bad, even though gold mine investors usually consider a mineral project financially robust when it has a 30-35% ranging IRR. But the Subika underground mine is bearing another potential for future shareholder's value accretion. This is the significant improvement in terms of lower all-in sustain costs that the US miner will achieve in Ghana once the production from the Subika underground mine will combine with that from the Ahafo mill expansion project. The catalyst will act sometime in the second part of 2019 following the finalization of the Ahafo mill expansion project where the company is targeting improved production margins and accelerated processing of stockpiles. The company is estimating a 24 to 28% decline in the all-in sustain cost per ounce of metal sold at Ahafo from the level of $1,050 to $1,250 per ounce sold in 2016. Commodity permitting, Ahafo will help the stock to reach the target price of $40.83 per share within the next 52 weeks. The mean is an average of eighteen estimates ranging between a low of $33 and a high of $50. The average target price is mirroring a nearly 26% growth from the market value at close Monday.